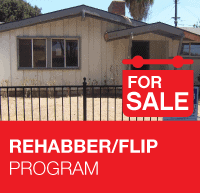 This is The Norris Group’s flagship hard money program for real estate investor flippers and rehabbers. It’s built for speed closing in as little as five business days when all paperwork is signed and all escrow instructions are delivered to us quickly. Are you an experienced investor? We offer lower points for pros! We can work with self-directed IRA accounts and entities (Corps, LLCs, partnerships, trusts, etc.) and there’s no prepayment penalty. Willing to put more down? Rates as low as 8.9% depending on the amount down in the deal. Call (951) 780-5856 and ask for Craig Hill. ** Points and LTV/ARV are subject to the required third-party appraisal which takes into consideration property condition, property location, and the investor experience. All loans subject to change.